When I got my first camera, it shot four megapixel images. When I started getting serious about photography, I was using an eight megapixel camera. By the time I started my business, I had a 10 megapixel DSLR. Now I’m using the Sony α7R III, with an astonishing 42.4 megapixels. It’s incredible how far we’ve come in such a short period of time. I want the ability to aggressively crop images in post, while still maintaining a large final image. 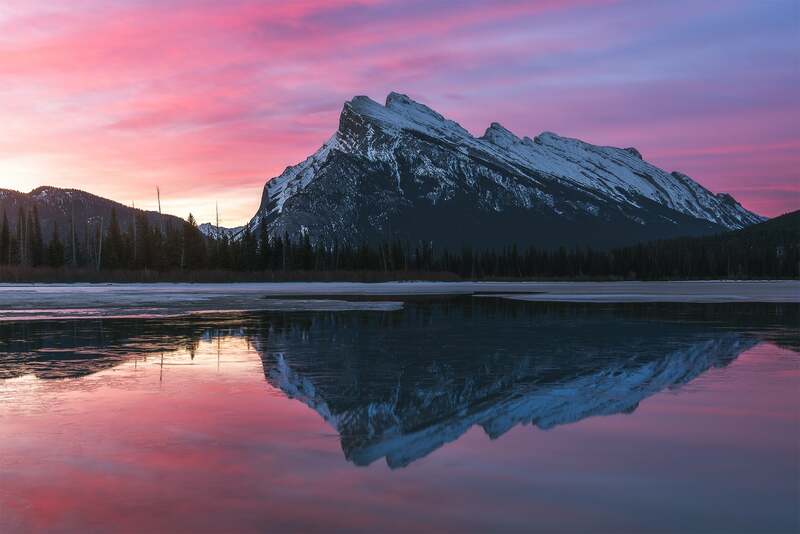 A quick backstory on the image: Our plan that morning was to shoot sunrise at either Two Jack Lake or Lake Minnewanka, but when we got over to that area (which is just on the other side of Mount Rundle, pictured here) we quickly realized sunrise was going to be a bust. The sky was completely overcast and there was no chance of getting color over there. We decided to pack up and head back toward the town of Banff to either find a place to shoot or get breakfast. 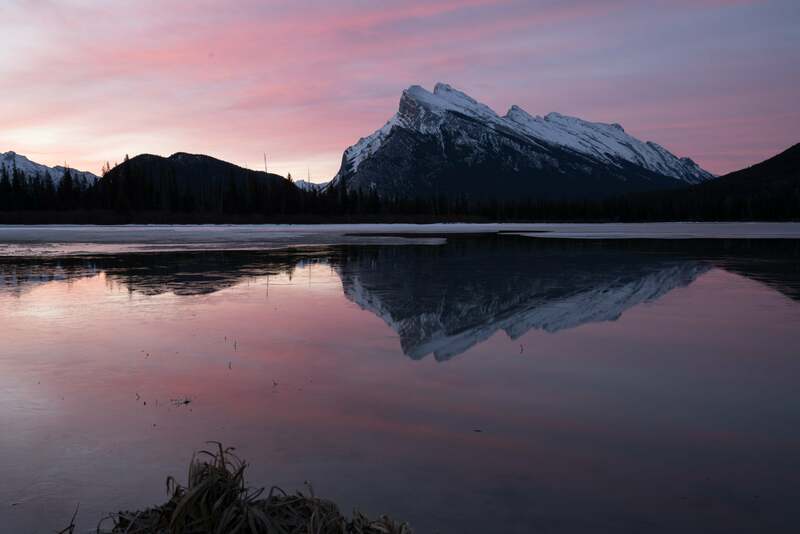 To our surprise, the sky lit up like fire and we had just enough time to get over to Vermillion Lakes and get a few shots in before the color was gone. Orginal file straight out of the camera. Note the scraggly flora in the foreground. I ended up being completely turned off by the foliage in the foreground, so I decided to crop right past it. As you can see when looking at the final version, I ended up cropping out a large portion of the bottom third of the image and a good bit of the right and left sides as well. The resulting image (after the crop) was still 6017x4013 pixels. That comes out to 24.1 megapixels! That means I was able to crop out over 20 megapixels of data from the image and the final version was still ample for making a very large high-quality print. That’s amazing! More megapixels won’t make you a better photographer, they can certainly make you a more successful one by helping in situations like the one above. Does that mean I’m suggesting you just blindly go with the most megapixels? Not at all. There are plenty of photographers for whom 24 megapixels is a plenty, giving them the ability to crop and maintain resolution for their final output. For me, I find that my 42 megapixel camera is the best choice. In the end, evaluate how you shoot and get the camera with the appropriate resolution for you. It’s not a question of more being better it’s a question of being able to fully and efficiently use what you have. James Brandon is a travel photographer and educator based in Fort Worth, TX. Follow him on Instagram @jamesbphotos and sign up for his workshops here. To learn more about back button focus and Brandon’s other tips and tricks for getting sharper images, check out his ebook Tack Sharp: A Step By Step Guide To Nailing Focus. Is Dynamic Range More Important Than Megapixels?